In mid-January, the Wall Street Journal analyzed the actual amount of play time of the average football game. They added up the amount of time the ball was actually alive and in play in four different games, and it averaged out to about 11 minutes. They concluded that the average game broadcast on TV shows 17 minutes of replays and 67 minutes of players standing around. With the biggest game of the year coming up, I decided to do my own analysis of the actual play time. The longest play of the game was an 11 second Saints kickoff, and subsequent Colts run back, after the Saints first field goal in the second quarter. The longest play from scrimmage was a 10+ second Colts pass that was intercepted by the Saints and run back for a touchdown late in the fourth quarter. Additionally, the National Anthem took 1 minute 48 seconds. The time in the picture above does not match the total result time because there were two Colts plays in the fourth quarter where the ball was hiked, but the play was whistled dead before the snap actually took place. The first was a false start by the Colts, and the second was a Saints time-out before the snap. They were removed from the after-game analysis. 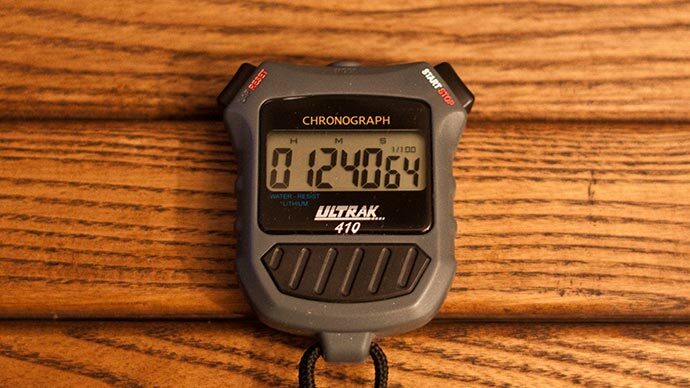 This was not scientific, it was simply me hitting the start/stop button on the stopwatch you see above. The most obvious timing issue was my reaction to the snap of the ball, especially on the three or four plays where CBS's coverage did not show the snap of the ball, but rather was focused on a single player who was not the center or quarterback. Additionally, on some plays, most notably the onside kick, it was impossible for me to tell when the play ended visually, and CBS really didn't pick up the sound of the whistles well, so I had to rely on the referee waving his arms to indicate the play was over. However, I tend to think that being fractions of a second late to start on some plays, and being a little long on others probably canceled each other out. I didn't know exactly when to stop timing field goals and extra points. I went with whichever came first out of the following: 1) the ball hit the netting behind the goal posts; 2) the ball hit the ground; 3) the refs made a call. All times have been rounded to the nearest second because…well…is sub-second accuracy really necessary here?